I’m sure I won’t blow your mind by saying that visuals are essential to creating content that will help your business stand out and draw in an audience. Not only do images help make text-centric content more readable, digestible, and memorable, but they can also be used to craft compelling messages that speak volumes without using a single word — just ask anyone who has posted a photo on Instagram or created a “Snap” to share a memorable moment with friends. Nearly a year ago, I compiled a collection of best-practice tips from some of the industry’s most creative and design-minded content experts, along with helpful imaging tools and examples. But, considering how rapidly visual trends come and go, we at CMI felt it was time to take another look at how to let your brand’s photos, videos, and graphics do the talking. Of course, we wouldn’t want a retrospective on such an image-conscious topic to show visible signs of aging; we’ve freshened up the discussion with a few new tips, tricks, and takeaways. Posting a photo or video online and waiting for the business offers to start rolling in is not an effective strategy. Neither is hinging your visual content success on creating the next viral phenomenon. As Joe Pulizzi often points out, content marketers need to focus on building a process and organization around the ongoing delivery of valuable information. This applies to visuals just as much as it does to any other content effort. Who is our audience, and what content do they crave? How can we create a consistent look and feel that promotes our brand value? Tourism Australia created a series of stunningly realistic 360-degree scrolling videos to demonstrate just how memorable and emotional a visit to its homeland can be. Bonus tip: Got questions on how to build your content marketing strategy? Our Book of Answers post on strategy and planning can point you in the right direction. While the wealth of DIY design tools available to content marketers (including the ones listed below) can give almost anyone the ability to create visual content, they don’t necessarily provide the know-how to do it well. CMI’s Creative Director Joseph Kalinowski reminds marketers that visual content efforts should be grounded in the fundamental rules of design — including the strategic selection of color and fonts, and the construction of a strong visual hierarchy. Step 1: Develop your theme. Consider its fun, visual applications, as well as how well your design will translate to both the topic and the purpose of the piece. Step 2: Gather your initial ideas. Your ideation process should include researching some visual references, as well as consulting with key stakeholders and trusted advisers to get their ideas and input. Step 3: Develop and execute on the best of the batch. This is where your attention to detail, your design skills, and your passion for the topic at hand should all come together. Prioritizing those ideas that hit the mark both creatively and strategically will give your visuals a distinctive edge and help your brand stand out. 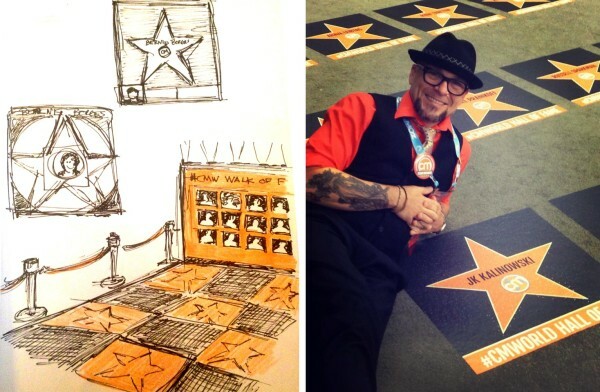 CMI’s creative director translates his rough ideas and sketches into a cohesive branded experience. Bonus tip: If you want to encourage influencers to share your visuals, give them as many accessible options as possible — such as tagging them on social media or providing them with access to raw files they can download from Dropbox. Some of the most memorable visual experiences are those that find a way to tap into the power of emotion. Need proof? Just look at any successful Pixar film — including Inside Out, which artfully translated human feelings into relatable visual representations. Authenticity: Connect with your audience around real, candid experiences that they can relate to and build trust on. Appealing to the senses: Images can go beyond communicating a place or thing — they can delight the senses by conveying warmth, evoking nostalgia, or creating a sumptuous feast for the eyes. Relevance: Consider whether an image will speak to your end users and fit in with their values and mindset. 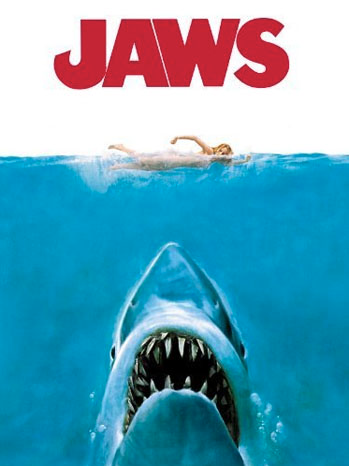 This iconic movie poster for Jaws crafted a simple visual story that played on the audience’s fears. While stock photographs and illustrations may save time, they can’t tell as compelling a story of your brand — and your customers — as custom images can. But if you are low on designer resources and feel that you need to turn to a stock service now and again, try to find a way to put your own branded spin on the images you select. 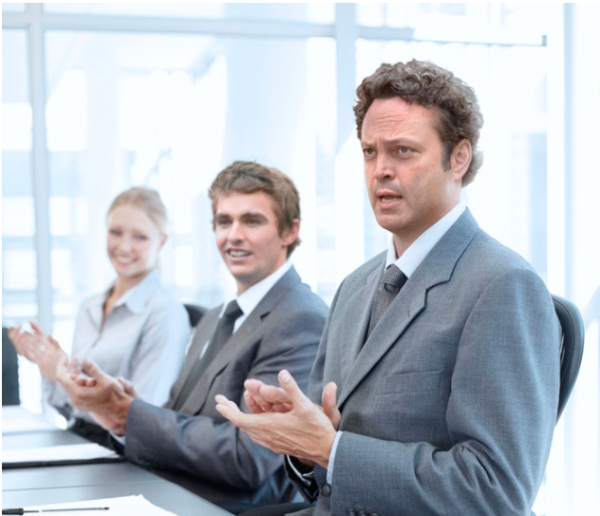 For example, to promote the film Unfinished Business, 20th Century Fox teamed up with Getty Images to edit stars Vince Vaughn, Tom Wilkinson, and Dave Franco into a series of business-themed stock photos. The images were made freely available for download on the iStock site, creating an attention-grabbing visual campaign that aligned well with the film’s theme. Content marketers can adapt their most popular written content into compelling visuals, like infographics, charts, or checklists. Not only is it an excellent way to draw fresh attention to your evergreen content, it helps make your brand’s insights more digestible, memorable, and shareable. The CMI team repurposed tips from our most popular SEO article into a handy infographic that our readers could clip, save, and share on social media (click to see the full graphic). It’s clear that consumers love to snap their own pictures and share them with their friends (heck, you can barely shake a selfie stick around these days without coming across someone Snapchatting their surroundings). Instead of interrupting their experience with product shots and promotional pitches, why not put their photography skills to good use by including their work in your content marketing? For example, take a look at men’s shorts retailer Chubbies. As Aaron Orendorff describes, the brand’s Facebook page and Pinterest boards are dominated by user-generated videos, pictures, and stories. 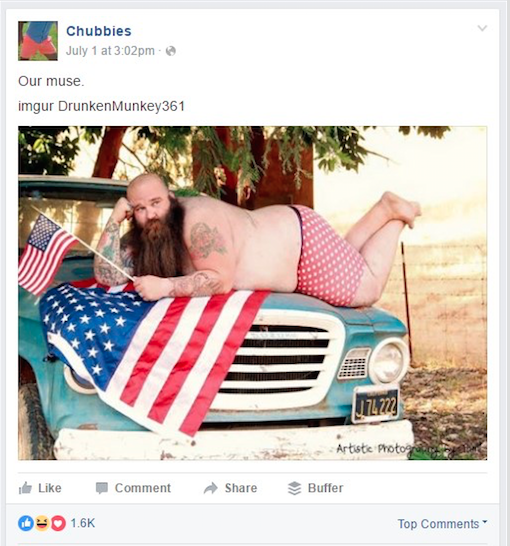 By recognizing fans’ interest in co-creating content, Chubbies does more than feed their passion for fashion — it provides them with an outlet for creative self-expression. Keep your visuals as brand-consistent as possible, including your use of corporate colors and logos. The best visual content has a consistent design motif — you can identify the brand it belongs to in an instant, no matter where the content appears. As Neil Patel mentions in this post on visual content strategy, a brand-defining signature style is a hallmark of some of the world’s most powerful brands. 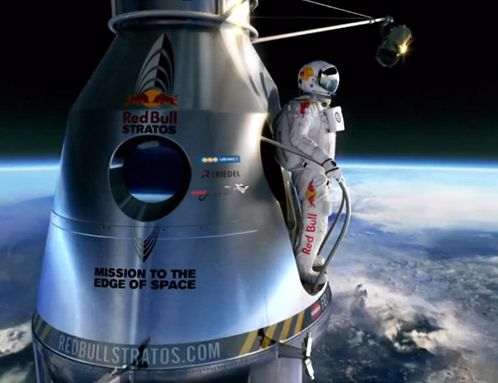 For example, Red Bull bases its visual strategy around images that convey speed, action, and breaking through boundaries — qualities that strongly align with the adrenaline-fueled lifestyle the brand promotes to its core fan base. Bonus tip: Don’t forget to add your logo to your original images, and tag them with relevant keywords, categories, and metadata. 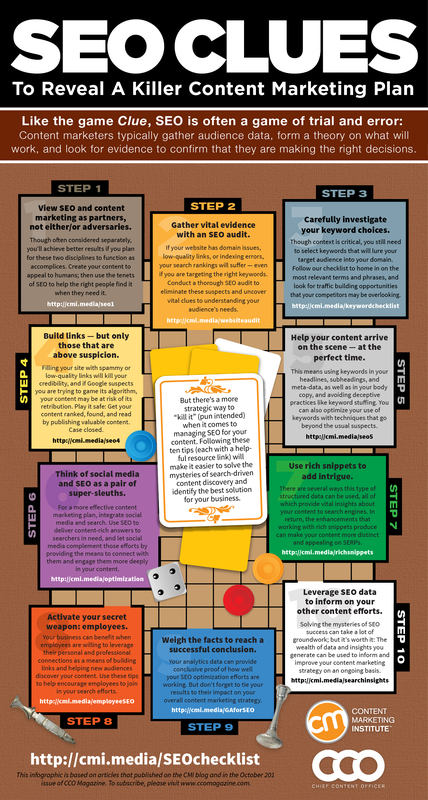 This will help your fans find your content — even when it gets shared in unfamiliar contexts. You wouldn’t hop on Snapchat to research a company’s job openings any more than you would draw cutesy cartoons on a colleague’s profile picture and share it across your LinkedIn network. Just as purpose dictates your audience’s preferred platform, your visual content should always be customized to fit the specific conversations and standards of communication that users expect on a given channel. The above practices should make it easier to understand what quality visual content creation entails; however, producing that content on an ongoing basis still presents a challenge for many businesses. Though there’s no substitute for the expertise and skill of a dedicated professional designer, the visual content tools below may be useful when those resources aren’t available — or they may even help you branch out in new visual directions you thought you’d never be able to explore. From the creators of productivity mainstay Evernote comes Skitch. Similar to Awesome Screenshot, Skitch enables Mac and IOS users to grab screenshots or access photos, and edit, annotate, or add to them using a simple palette of drawing, design, and annotation tools. It’s particularly handy for highlighting sections of images for use in demonstrations and tutorials. Users join the conversation with Mapme, a socially influenced mapping tool. Brands can create maps based on their own designated interest or one from Mapme’s list and share it with their audience. Users then can add new locations and sites of interest to that map — it’s crowdsourcing for locations of interest. 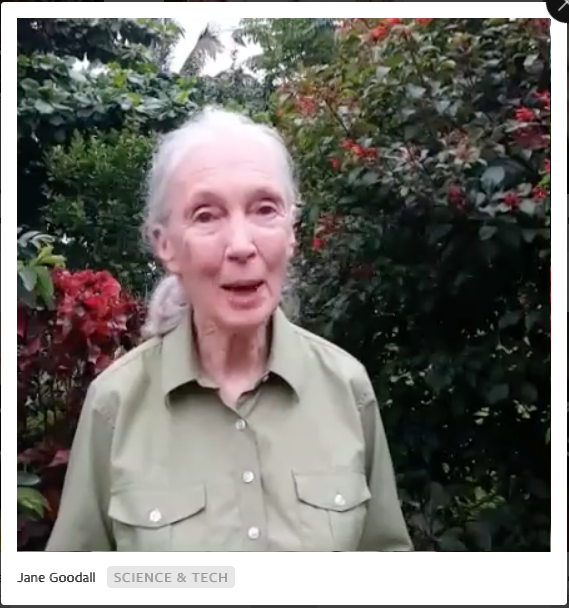 Livestreaming — real-time online video broadcasts — has made a jaw-dropping splash on the social media circuit. Available through mobile apps, as well as on the desktop, these platforms provide the functionality that gives brands a whole platform for capturing moments as they happen, and combining them to create uniquely engaging stories to share with their audience. Everything on GoAnimate is controlled by simple drag-and-drop tools, and the platform automatically syncs your narration to the animated figures on screen. GoAnimate has huge libraries of assets representing hundreds of industries and occupations, and enables you to publish directly to YouTube or other sites like Wistia, Vidyard, and Viewbix. Lorna Probert of Aardman Animation (home of the wildly popular Wallace and Gromit films) told CCO magazine that she’s a fan of using Rapt Media, as she finds the system to be flexible, straightforward, and easily embeddable into client websites. “The interactive videos through Rapt allow the audience to actively make decisions, helping us create a more engaging experience and gain more insight about the interests and preferences of our customers in the process,” she says. “VideoScribe makes creating white-board-drawing videos so easy. It looks like we paid someone thousands of dollars to create a hand-drawn video, but it took us just 30 minutes. You can even upload your own images for it to draw, and add voice-overs and music directly in the software,” Louise Hendon says in the October 2015 issue of CCO. The Zaption platform enables brands to add images, text, questions, and quizzes to any video, effectively transforming passive videos into interactive learning experiences. Although used primarily by educators and instructors, this platform offers brands value for solidifying their message and ensuring that viewers fully retain and understand video content. While blog posts, charts, and videos are powerful content marketing mainstays, with a little ingenuity, you can take your visual content in some exciting and unexpected directions. Our Benchmarks, Budgets, and Trends research shows that the use of interactive content is on the rise. If you are looking to experiment with your content formats as a means of grabbing a greater share of attention, the following are some tools that can help you add a bit of innovation to your arsenal. If you’re hesitant to dabble with your own HTML code or simply want an easier way to start embedding content, embed.ly can be a huge help. It is an easy-to-use, quick bookmark tool that converts the content you want to embed into an iFrame. Create games for iOS, Android, and HTML5 using a drag-and-drop interface — no coding required. HSTRY is a visual timeline tool. You can choose the visual content to piece together, select prompts to help your viewers navigate to different information points, and shift content back and forth to meet the sequence that makes most sense for your topic. ThingLink enables users to annotate their image and video content with notes and rich media links — great for marking up graphics with links to your additional content resources on the topic at hand. Slidely syncs with your Facebook, Instagram, and Flickr accounts. It uploads your images, videos, and music to produce an interactive multimedia slideshow. 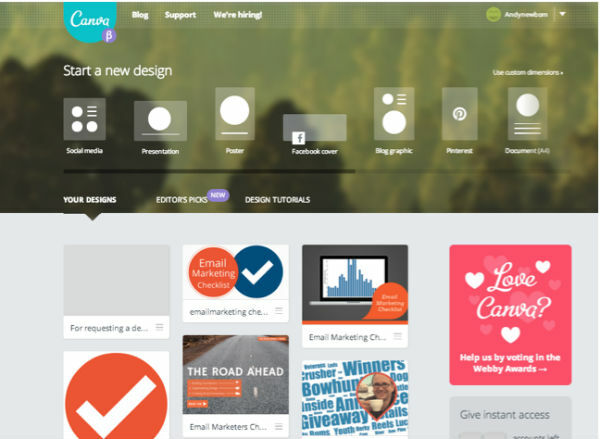 Bonus tip: Get more tools for adding jaw-dropping interactive visuals to your content. 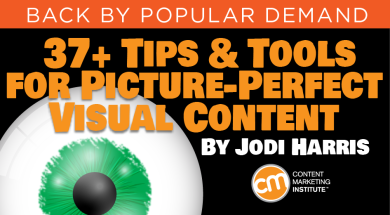 Of course, these tools are just the tip of the iceberg — content marketers can explore plenty of other solutions to help take their visual content creation efforts from a time-consuming necessity to a fun and engaging process. If I missed one of your favorite helpers, let us know in the comments.